Field with young cassava. It takes about a year for the cassava root, manioc, to be ready to be harvested. It takes less time for the leaves to be harvested and eaten. They are the main vegetable that is eaten. Peeling of the cassava. There are about 40 women working here on the farm. 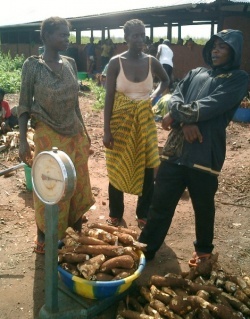 The women get to keep 1/6th of what they harvest as their payment. After they have been peeled they need to stay 3 days in the water to get the acid out. 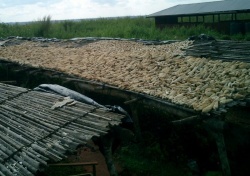 After having soaked for 3 days the cassava is put on racks to dry in the sun which takes care of some more acid. 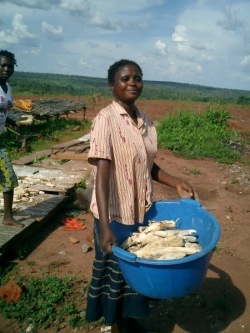 When the cassava is dry it is collected again. 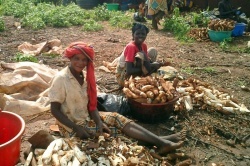 Besides taking home their part some women also buy more cassava to sell in the village. This girl is maybe 14 0r 15 but she also carries 30-35 kg on her head. 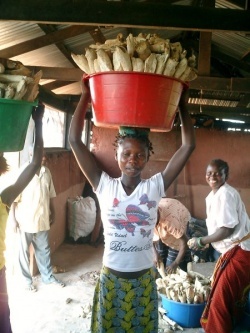 At home the cassava is ground up and boiled. In Mushapa they mix them with corn flour. They shape them into balls which weigh @ 250 gr.